Home :: Poly Bags :: Clear Polythene Bags 175 x 225mm Light - 7 x 9 Inches Approx. 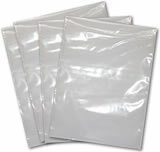 Clear Polythene Bags 175 x 225mm Light - 7 x 9 Inches Approx. 1000 Clear poly bags, use to Keep contents clean, dry and visible.